LET's mission is to build and rehab 50 schools; train 500 teachers; award 5,000 scholarships principally to girls to enroll in school and to stay in school; to support women to enter teacher training colleges; and, to enroll market women in literacy programs. LET is a grant making initiative. 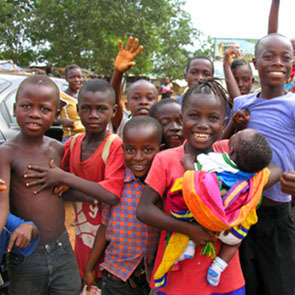 Welcome to the Liberian Education Trust (LET), a charitable trust formed to harness American support for the restoration of basic education in post-civil-war Liberia. and as a result, Ellen Johnson Sirleaf was elected president. She is a highly-regarded, well-educated international civil servant and business leader. She is the first woman to become the head of an African state, but most importantly, she is dedicated to universal education and the elimination of illiteracy. Johnson Sirleaf has her work cut out for her as she inherited a collapsed state with a very small budget and enormous needs: 80% unemployment; extreme poverty with average earnings of $1 a day; no electricity; no landlines; no running water; no sewage system; unpaid police and little infrastructure. Facing so many challenges, she had to focus on a limited set of first tier issues upon taking office: peace & security; economic growth; corruption; the rule of law. There were not sufficient funds in the state budget to address the massive needs in education. Thus, during her first visit to the US as president-elect in December 2005, as Americans asked what they could do to help, she envisioned LET as a way to harness support for Liberia’s educational needs. LET is a project of the AllAfrica Foundation, a U.S. public charity, that focuses global public attention on critical issues of African development. All contributions to LET are tax deductible to the full extent of the law.